This months theme was Jet Set! What Birchbox says about this product: This targeted sheet mask features arbutin and mulberry root to help even out your skin tone. FUll size: $24 for three masks. What I think: I can not wait to try this out, I have heard a lot of good things about these masks, They also have anti blemish ones on their website, I might end up buying some for pampering myself "during that time of the month". What Birchbox says about this product: Water and sweat are no match for this long lasting, oil free lotion, which provides broad spectrum protection while hydrating the skin. paraben, fragrance and oxybenzone free. FUll size: $48. What I think: With summer here I can alway use more sunscreen. This sounds perfect for the face, being paraben, fragrance and oxybenzone free. What Birchbox says about this product: Two in one lip and cheek stain which is long lasting. What I think: I am not to sure about this. I have the benetint and don't love it. But I will try it out anyways. What Birchbox says about this product: Who needs the sun when you can get a safe, buildable and natural looking tan with these bestselling European towelettes. FUll size: pack of 8- $14.99. What I think: I am terrified of self tanners, I have NEVER had a good experience with them I have tried a lot of drugstore self tanners and always end up looking blotchy/streaky or it wears off terribly. But I guess it doesn't hurt to try it on my legs, but I won't be surprised if I don't like it. What Birchbox says about this product: pair this retro inspired accessory with big sunnies. 1 head band: $14.00. What I think: I love headbands, especially retro inspired ones. The best this is that it is wired, so when I tie it, it stays in place and does not budge! I am going to buy at least two more with my coupon. Well that is my June birch box. I am very happy with it this month. The mask and headband really made my day. Hi Rita! 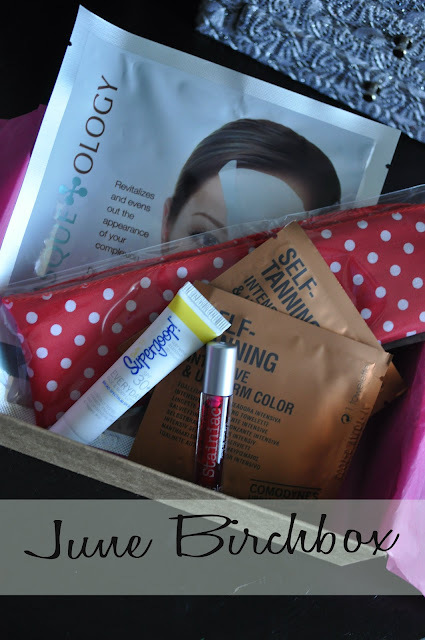 I've been following your blog for a little while now :) My June Birchbox was pretty good - loved the headband & perfume in mine. Thanks for linking your june birchbox. You didn't like the Jouer Tint? I heard good things about it and was thinking of getting one myself. I'm not a huge fan of the Jouer Tint. But my face is sensitive, so I hate wearing any makeup except mascara and eyeliner. I could mail you my sample if you want to try it! I got the brightening mask too, I haven't used it yet but I'm pretty excited. Your headband is my favorite that I've seen so far!!! I got bandaids that my 5 year old daughter loves instead! Haha!! !